Hi Friends! Welcome back to Healthy Grocery Girl! Today I’m sharing with you 3 nostalgic comfort food recipes that are Trending In The Kitchen that are made with real, nourishing ingredients. This time of year I love to get cozy in the kitchen and make warm, comforting meals that bring back happy memories. 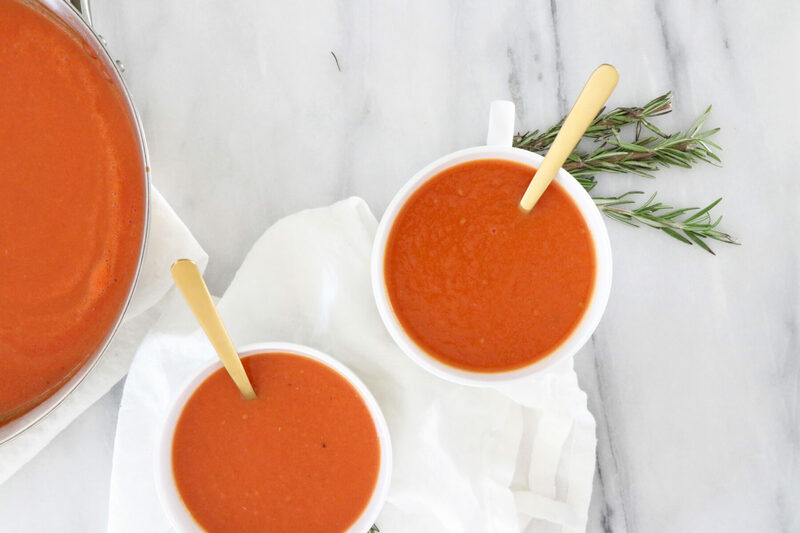 Growing up I loved grilled cheese and tomato soup so today I’ll be sharing a vegan version that is super creamy and delicious. We’re also making chili cornbread pot pie, because… yum! A big thanks to our sponsor Pompeian. Watch today’s cooking video to learn more about why I love using their EVOO, cooking sprays and vinegars in my recipes! Over medium heat, spray a large sauté pan with Pompeian coconut oil cooking spray. Add the diced onion and garlic, sauté for 3-5 minutes adding a few more sprays of cooking spray, if needed to prevent burning. Remove from heat and add the chili powder, green chiles, diced tomatoes and all three beans. Stir together then pour into a baking dish. Next make the cornbread, in large bowl add olive oil, non-dairy milk, eggs, juice from two whole lemons and whisk together. In a small bowl add the cornmeal, GF baking mix, baking soda and sea salt, whisk together. Add the dry mixture to the wet mix and stir just until well blended. Spread over chili and bake in a preheated oven at 350 degrees Fahrenheit for 40 minutes. Warm olive oil in a large heavy pot over medium heat. Add the onion, garlic and tomato paste. Cook 5-10 minutes, stirring often. Add cans of tomatoes with juices, balsamic vinegar and water to pot. Bring to a simmer for 30 minutes. Remove soup from heat; add coconut milk, salt and pepper. Using a stick blender (or high speed blender) carefully purée soup until smooth. Warm large flat bottomed skillet over medium, spray with Pompeian Avocado Oil cooking spray. Lay down two slices of bread, place a slice of vegan cheese on each and cover pan with a lid for 2-3 minutes. Remove lid and top one slice of bread with 1⁄4 avocado, sliced. 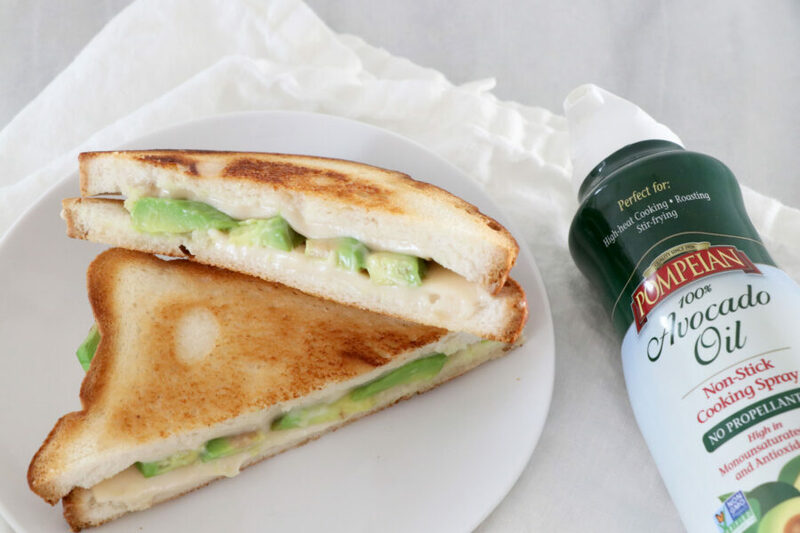 Combine slices to make a sandwich and add a few more sprays of cooking oil if needed. Flip and grill the sandwich until cheese is melted and the outside is toasted to your liking. WHY I LOVE USING POMPEIAN COOKING OILS, SPRAYS & VINEGARS! Organic EVOO is a great kitchen staple and so versatile for cooking, baking and even DIY beauty! What I appreciate about Pompeian is their commitment to quality which you can tell by the amazing taste of their EVOO. They were the first Olive Oil to receive the North American Olive Oil Association Seal, which means they undergo frequent testing for quality control. Their EVOO is also USDA Organic and part of the non-GMO project! 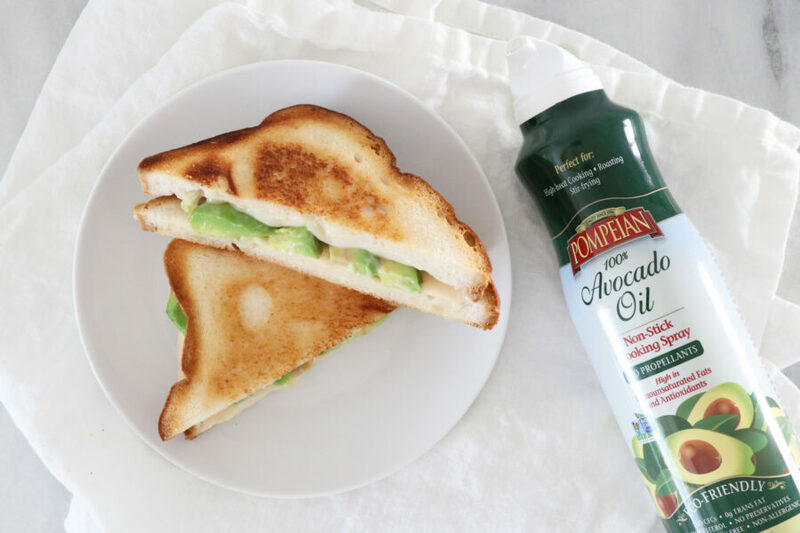 I also love using Pompeian’s Coconut Oil spray and 100% Avocado Oil cooking spray. Both have a high smoke point so they are perfect for making Grilled Cheese or other heated recipes! They are also eco-friendly with no chemicals or propellants, only 100% coconut oil and avocado is sprayed out. Lastly, Organic Balsamic Vinegar, it’s not just for salad dressing! Balsamic vinegar adds a rich, delicious flavor to recipes! Pompeian’s grapes are organically grown in Italy, and harvested at the ripest moment to ensure the highest level of flavor. The grape juice is slowly cooked and then placed in barrels for refining and aging, which adds a complex flavor. It is also caramel color free and naturally gluten free! Disclosure: Thank you to Pompeian for sponsoring this post!